It’s easy to take our feet for granted until we have an injury that creates heel pain. Each step becomes a painful reminder that you’ve injured yourself. If you have heel pain, have it checked promptly to keep it from getting worse. An orthopaedic specialist can tell you what’s causing your heel pain. The most common causes of heel pain are heel spurs, plantar fasciitis, excessive pronation and Achilles tendinitis. Often, the problem develops from the way you walk. Wearing poor quality shoes or improper footwear, carrying too much weight and putting too much stress on your heel bone can cause heel pain. If you have a heel spur, it will most likely show up on an X-ray. Unfortunately, many people who have heel spurs also have plantar fasciitis. Plantar fasciitis occurs when you’ve inflamed the tissue on the bottom of your foot that runs from your heel to the ball of the foot. Athletes often experience this painful foot condition. Excessive pronation has to do with the way you walk. It means that each time you take a step, you have too much inward motion. Many people find out they pronate after they injury their hip, knee or lower back. Feet problems can lead to injuries in other parts of your body. Another type of heel pain is Achilles tendinitis. If you have pain at the back of the heel, you might have inflammation of the Achilles tendon. Lose weight. If you have obesity, losing weight can significantly reduce the amount of force you place on your joints and tendons. Wear proper-fitting shoes. Shop for shoes that have heel support and shock absorbent soles. You should not be able to hold a shoe and twist it. Wear shoes designed for specific activities. If you run, wear running shoes. If you take Zumba® classes, where a shoe that has a pivot point and allows for lateral movement. Running shoes are built for straight forward motion. Replace your shoes. If your feet begin to ache, it may be time for a new pair of shoes. Shoes may look like they’re in good shape from the outside, but they can be worn down on the inside. Always warm up. Whether you’re going for a walk or about to jog 5 miles on the treadmill, take the time to warm up your feet and ankles. Gradually increase exercise intensity. 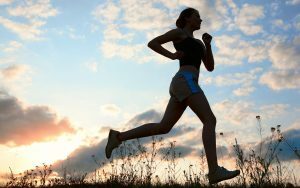 If you haven’t been jogging lately, don’t try to jump back into your old running routine. Take it slow and pace yourself. Your body needs time to adjust if you’re exercising for longer periods of time or at a higher intensity. Seek help when needed. Consult an orthopaedic specialist if you start to have any kind of foot pain. Ignoring pain can make it harder to recover from certain injuries. + Learn about the experienced orthopaedic and spine specialists at Virginia Orthopaedic & Spine Specialists. + Contact us today to learn more about foot and ankle treatments available to patients in Norfolk, Virginia Beach, Suffolk, and throughout Hampton Roads.